Three Teens Finished Their Fantastic Trip to VfL Wolfsburg with Linglong Tire | Linglong Americas, Inc.
On April 30, in the match between VfL Wolfsburg and Bayern Munich at Volkswagen-Arena, three children selected by Linglong Tire from its football training camp successfully finished their fantastic trip to VfL Wolfsburg with Linglong Tire. 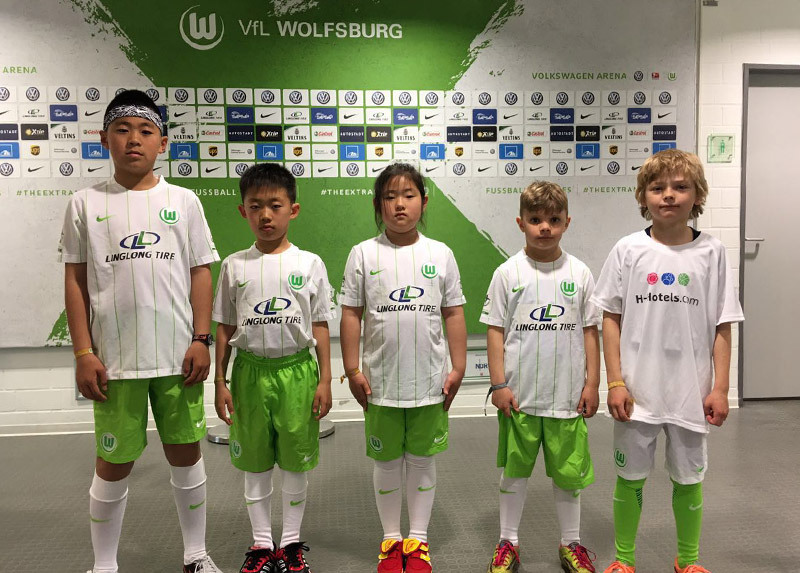 Fantastic Trip to VfL Wolfsburg with Linglong Tire is a depth cooperation between Linglong Tire and VfL Wolfsburg after Linglong being the top sponsorship of VfL Wolfsburg in 2014. Linglong will carry this activity on for 4 years, mainly focus on teenagers between 6 to 12 years old, who will accept the professional and typical training from six coaches of VfL Wolfsburg. At the same time, talented little players will have the chance to go to Germany, and go inside the field as caddy with referee, taking a good memory on the way to achieve their football dream. The place for this activity is in Wolfsburg, which is famous as the location of Volkswagen AG's headquarters and the world's biggest car plant. The Autostadt is a visitor attraction next to the Volkswagen factory. Wolfsburg is one of the few German cities built during the first half of the 20th century. During their trip, the three teens learned the history of automobile’s development and the process of manufacturing a car in VW Autostadt, which made them learn a lot with joy. The three kids finished their trip successfully with joy and excitement. It is well believed that this trip will be an unforgettable memory for them. Linglong Tire hopes that there will be more children loving football taking part in our activities in the near future!